CYPRESS products have been widely used in the medical technology, industrial, automotive, home appliances and entertainment, aerospace and telecommunications sectors for years. The manufacturer is one of the world's leading providers of embedded system Solutions. Special focus is placed on the PSoC® microcontrollers (Programmable System on Chip) as well as the Embedded Memory and USB-ASSP solutions. The PSoC® family of microcontrollers includes four subfamilies with more than 500 individual chip solutions. PSoC®4 and PSoC®5 work on a Cortex®-M0 / M0+ or Cortex®-M3 basis and offer additional high-quality hardware such as capacitive touch function or Bluetooth Low Energy. 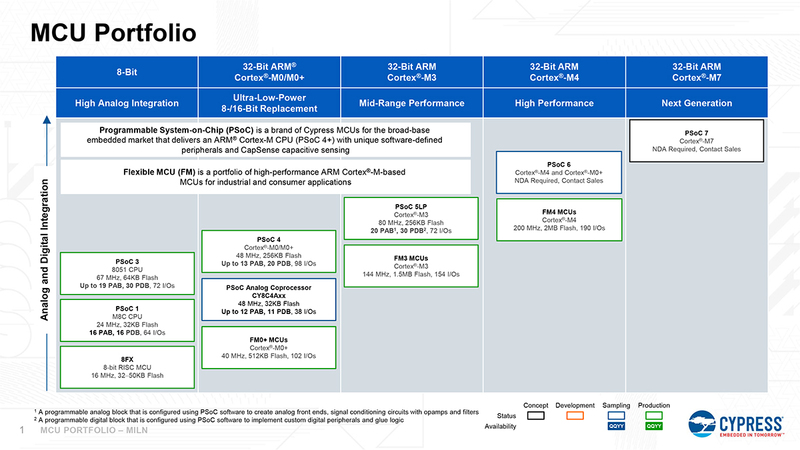 With the PSoC®4 BLE (Bluetooth Low Energy), CYPRESS currently offers the fi rst fully functioning Bluetooth 4.2 “single-chip solution” with bestin-class integration. FM = Flexible MCU – The 32-bit microcontroller platform with over 700 derivatives is based on the ARM® Cortex™- M0+, Cortex®-M3, Cortex®-M4F processor cores. FM Family is intended for use in the industrial sector. The license for the new ARM® Cortex®-M7 strengthens the PSoC® and FM families to a great extent. Be your own semiconductor manufacturer – Design your own chip! 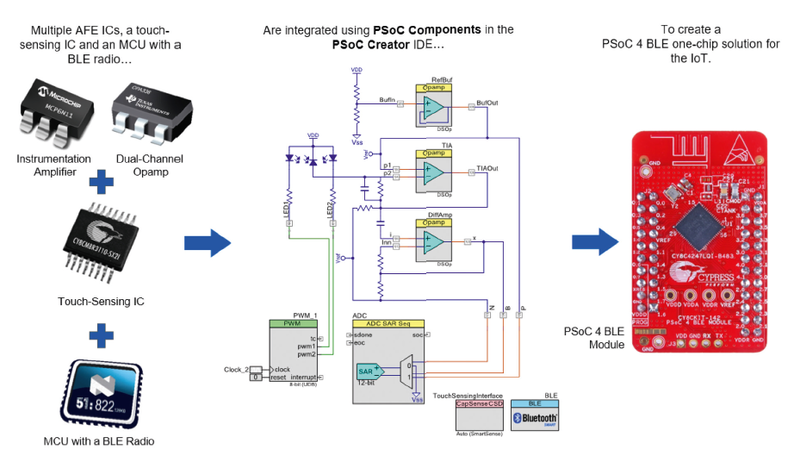 What is the biggest advantage of using the modern PSoC® MCUs? You can now integrate your digital and analogue components directly in the IC rather than having to attach them externally. You can now realise numerous digital functions which run in real time, leaving the CPU free for other tasks. Implement your own interfaces, counters, oscillators and much more according to your own requirements. Special register elements create data connections in both directions between the CPU and the digital circuit. A powerful library with more than 150 circuit elements is available. You can individually create and easily add additional elements. For analogue functions, the PSoC® is equipped with e.g. low power comparators, op-amps, temperature sensors, ADC, DAC, analogue multiplexers and much more besides. These enable you to relocate numerous external analogue elements into the chip and wire them up individually.